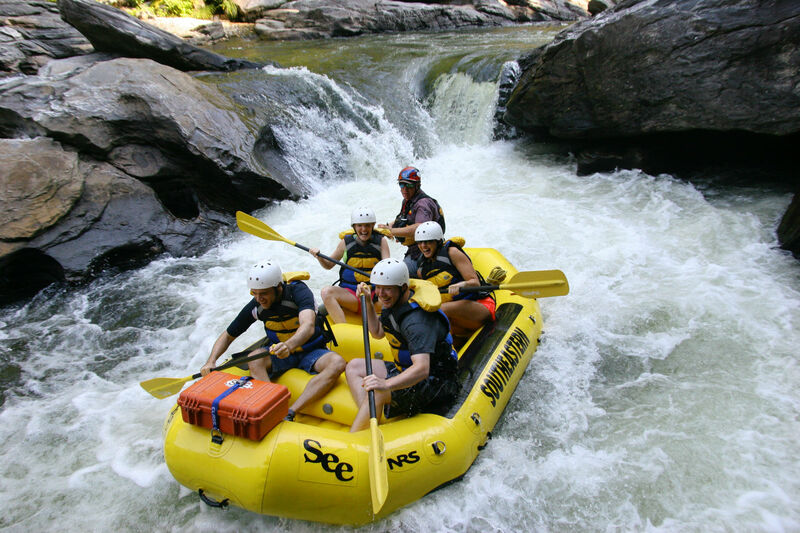 On multi-day trips, guests are often enamored with the gear boater’s ability to navigate complex rapids, without the assistance of a crew. The other guides will politely agree and even add a compliment of their own toward their fellow coworker. But a careful observer might note a smirk or even a tinge of jealousy in their voice. Of course, maneuvering a heavy-laden gear boat is no easy task, but having a raft full of guests has its own set of challenges. 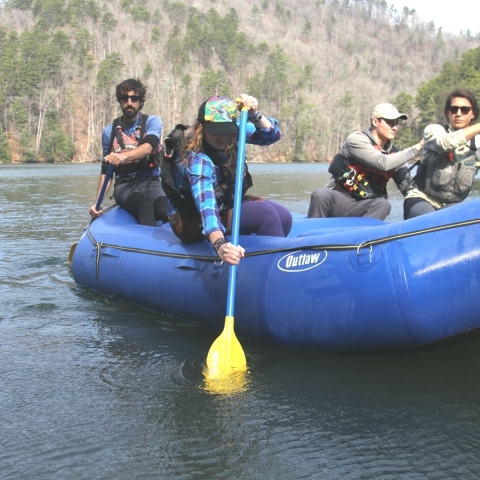 For a guide in a paddle raft, being able to effectively use your crew is as important as being able to read the river currents and execute paddle and oar strokes. 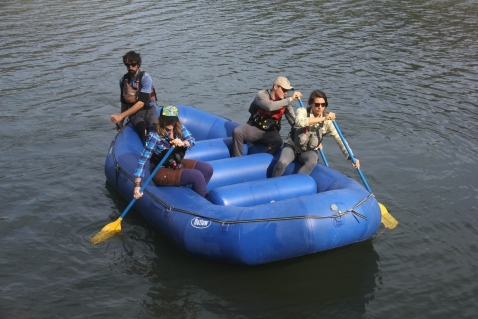 How you seat your crew and position their weight will depend on the size of raft, type of river, the nimbleness of each guest, and your personal guiding style. The standard sitting position for a guest is to have most of his or her weight on the outside tube. 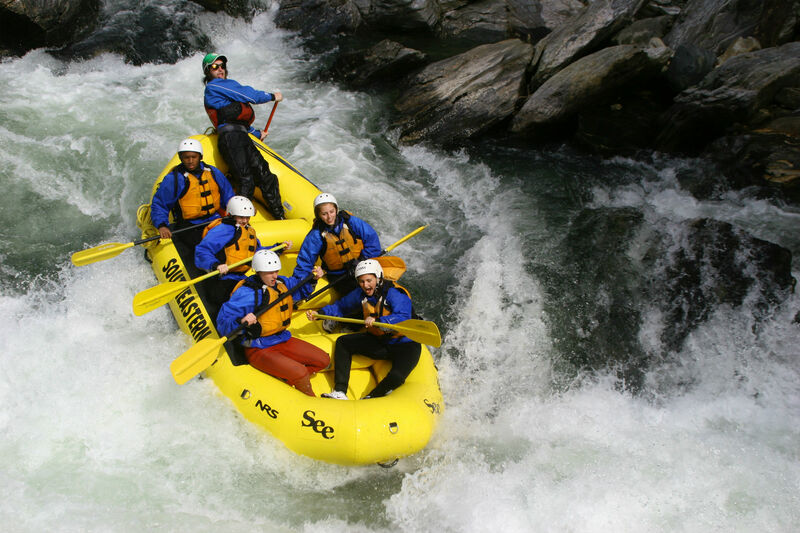 However, if you’re on a technical river with lots of “ejector rocks” and/or have guests who are timid or less agile, you may want them to sit deeper in the raft. 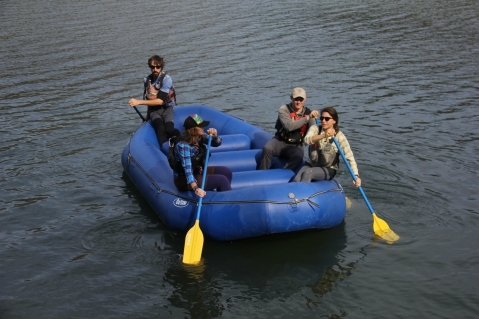 In order to help the guests stay in the boat, instruct them to hook the foot closest to the outside tube under the area where the thwart attaches to the raft. Warn guests not to brace in with a bad foot, ankle, or knee. 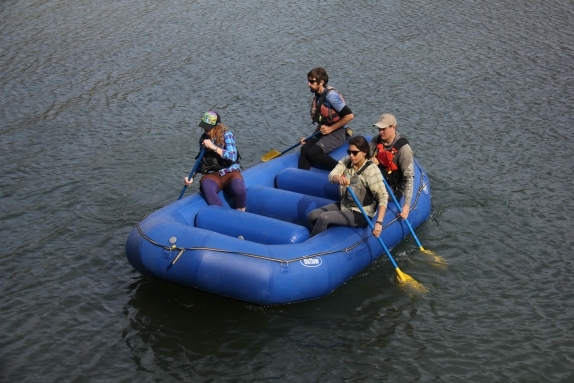 The way a crew’s weight and strength is distributed has a dramatic effect on the raft’s performance. If you’re on a high volume river, then you may want to front-load your raft, giving it more power to drive through big waves and holes. However, on low volume rivers such features may not be an issue. 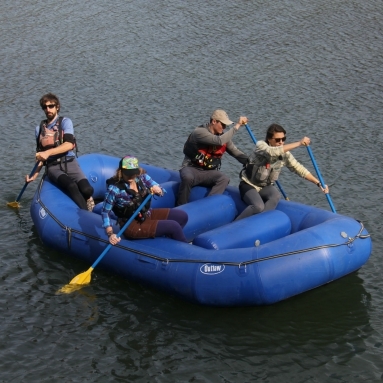 Thus, you may choose to concentrate the crew’s weight in the middle of the raft, closer to the pivot points, and keep the bow light so the raft will be easier to turn. Also, if you’re in a paddle raft and have an odd number of guests or any unequal distribution of power, it’s usually better to stack the most power on the side opposite from you. The bow compartment gets the wettest and overall best ride. However, people sitting in the front sometimes have trouble locking in the raft. If you have a guest that’s fragile, scared or a bad swimmer, you may want to sit that person in front of you, so you can grab him or her if necessary. Alternatively, you can have the person hang on rather than paddle through certain rapids; this is the position where a paddler is least needed. Sometimes an experienced paddler is not an asset to the raft. If you have a guest that likes to throw in strokes, set him or her in the middle. This forces the paddler to follow someone else’s lead and places him or her in the seat with the least influence on turning the raft. There are trips where all these factors will conflict with one another. The person you want to put on the left has a bad left knee. Or the paddler you want to place up front is cold, scared, and hard of hearing. So in the end, it’s a judgment call. No two crews are exactly the same and part of guiding is being able to adjust to their strengths and weaknesses. 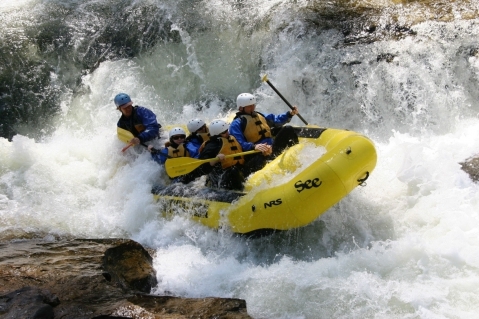 Center loaded raft in action. Due to time constraints, sometimes you have to teach your crew paddle commands once you’re on the water. However, the best instruction happens when you sit in the raft and demonstrate the strokes. When you need the entire crew to paddle with the same stroke, call “All” ahead of the stroke name such as “All Forward.” Train them to keep doing that stroke until another command is given. While trying to maintain momentum through flat water, try not to have your crew give more than 8-10 strokes at a time before taking a break. In shallow, technical water you may want to call strokes in increments such as “Forward One,” or “Back Two” to keep from overshooting your line. Using increments of one or two strokes in smaller rapids is also a good way for beginner guides to learn their crew’s strength. However, on larger volume rivers calling strokes in increments is rarely needed. It’s important for your crew to paddle in unison. The most efficient way to move through the water is to exert force, glide on the propulsion, and then throw in another propulsion stroke to increase or at least maintain speed. If the crew paddles erratically, it’s impossible to build this rhythm. Also, having the guests paddle together allows you to throw in your turning strokes during the glide portion of this sequence, so you don’t have to work against the forward or backward momentum of your crew. The best way to get the guests in rhythm is to designate one of the paddlers in the front as the pacesetter and have everyone else follow his or her lead. When teaching the forward stroke, emphasize leaning forward, planting the paddle, rising-up and unwinding. Show your guests the difference between the proper paddling technique with straight elbows and twisting the torso versus the improper technique of relying on arm strength. A lot of first time rafters have a mental image of charging through big waves with speed, and therefore they think if the guide calls for backstrokes, then the raft must be offline. So inform the guests that in the technical rapids, you may call more backstrokes than forward strokes. Explain the command is commonly used to slow the downstream momentum, allowing the raft to stay in the channel of water going around an obstacle. A simple analogy: using backstrokes through a rapid is like tapping the breaks when negotiating a curvy road. Most guides find it easier to have the paddlers pry off their hip rather than doing a traditional backstroke. When teaching the pry, emphasize getting leverage off the body like using a crowbar. 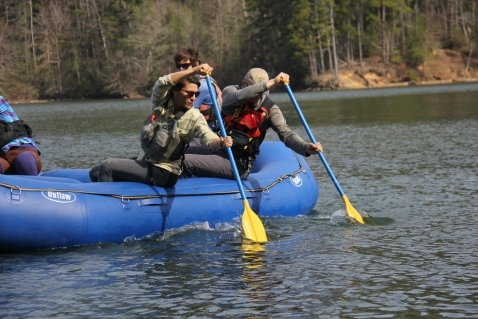 Unlike a pry done for steering purposes, a pry used to slow down the raft should put more emphasis on pushing the blade forward rather than away from the raft. However, if a paddler has a short torso or is sitting more in the raft than on the tube, he or she might not be able to pry without the side of the raft interfering. In this case, teach him or her to execute the backstroke by leaning back and planting the paddle, then untwisting while rolling forward, mimicking the same movements as a sit up. To use your sides independently, you have to introduce your crew to the concept that they’re sitting on the left or right side of the raft. This left and right pertains only to the raft and has no relation to whether the raft is pointed upstream or downstream. It’s important to note that you have one side doing something different than the other side, always say the side then the command, such as “Right, Back. Left, Forward.” Think of it this way, if you have a large audience and need all the people named John to step forward, then you say “John, step forward.” If you were to say, “Step forward, John,” you might have several people stepping forward before they realize you mean only those named John. Or you might have some Johns hesitating before acting. Also, identifying the subject first, action second is an assertive style of speech. Saying the action, then subject, as in “Forward Left,” is passive, which is fine if you want to sound like Yoda, but not if you want to guide rafts. No matter how confident you are in your ability to maneuver the raft on your own, there will be times when the only way you can make the line is to have the crew help. And if you have a large raft or a heavy load, then using your crew to change the angle of the raft saves strain on your body. Even when using oars, if you lose or break an oar, or just get into a tight spot, having a crew that understands how to turn the boat can keep the raft in control. There are variations on how you train your guests to turn the raft. On western rivers a lot of guides call the commands “Left Turn” and “Right Turn.” “Left Turn” means left side goes back; right side goes forward. “Right Turn” means right side goes back, left side goes forward. This uses few words to get a strong response. Other guides teach their crews exactly what they want each side to do. For example, if they want to make a quick turn to the left, they call “Left Back, Right Forward.” Rather than the command being a concept, which the guests have to process, it’s a statement. Besides just turning the raft in place, there are moments when it’s nice to be able to change the trajectory of the raft by just having one side paddle forward. This is why some guides also teach their crews to obey commands directed only to one side but not the other. Why would you need a one side to paddle forward while the other side does nothing? 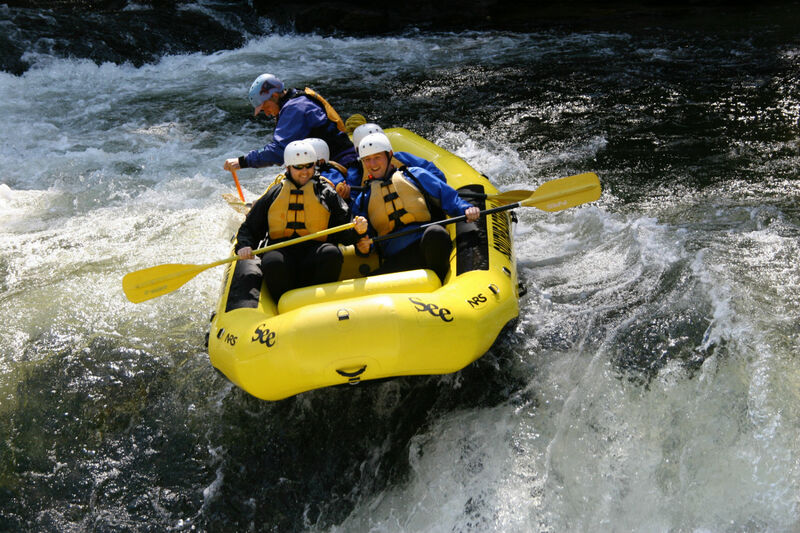 A “Left Back, Right Forward” doesn’t have the same effect on a raft as a “Right Forward Only.” With a “Left Back, Right Forward,” the pivot point is in the center of the raft, and the raft changes the angle while maintaining its position in the river channel. 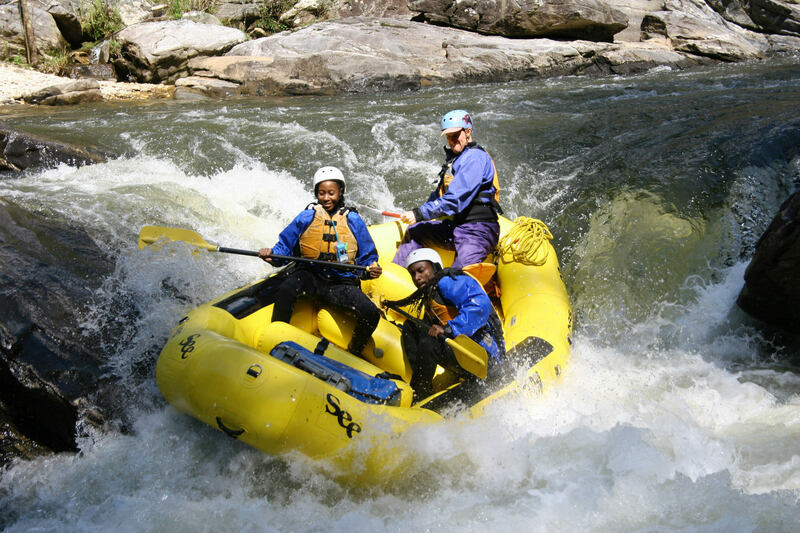 A “Right Forward Only” not only turns the raft to the left, but also causes it to arc to the left in relation to a pivot point outside the raft. This can be a good way to drive into an eddy or use an eddy line to pull the raft to the left. 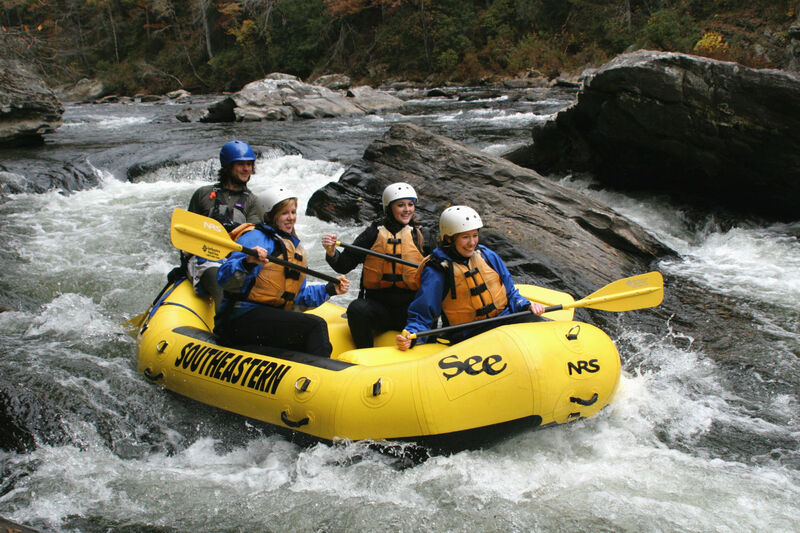 If the guide calls a “Left Back, Right Forward,” the raft will have the angle, but not the momentum to take the raft left. Calling for forward strokes on only one side is also a convenient way to correct a ferry angle. Let’s say you’re making a ferry from river left to river right, with the bow pointed upstream, and you blow your angle. If you call a “Right Back, Left Forward,” you regain your angle but kill your momentum. But if you call a “Left Forward Only,” then the angle is corrected, or at least maintained, and you keep your speed. No matter if you use left and right commands, left and right turns, or Jim’s side and Bob’s side, practicing these maneuvers is the key to making them work. If you teach your crew these paddle commands at the put-in, but then don’t use them until the middle of the big rapid, then you will be disappointed in the results. The best way to prep your crew for turning the raft is to do controlled spins in the smaller rapids. Drive the raft into an eddy to initiate the turn. Have the one side paddle backward while the others paddle forward to keep the turn going. After you spin once or twice, call an “All Forward” to halt the turning motion and straighten up for the tail waves at the bottom of the rapid. Spins make the little rapids more fun, and the crew feels like they’re taking special lines. But more than anything, it’s training the guests to quickly and correctly respond when called upon. 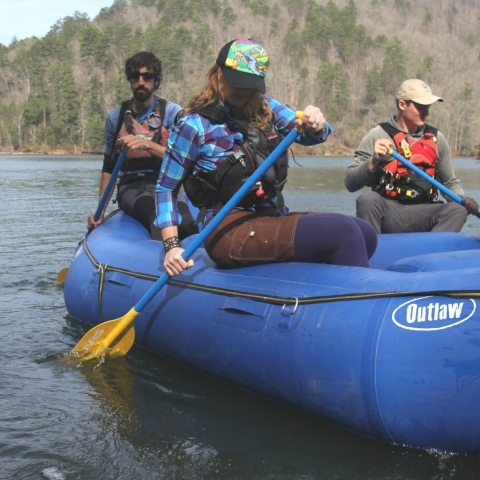 Some guides teach the draw stroke to their crew and use it in certain rapids with either a “Right Draw” or “Left Draw.” Having one side of the raft draw can pull the entire raft over without altering its angle or diminishing its speed. But the draw stroke takes practice to be effective. It can be especially overwhelming for a novice paddler and is therefore not taught by most guides. The guides who use it swear by it, while their equally experienced co-workers may never feel the need for it. If you decide to teach the draw to your crew, take the time to train them well and use it a lot in smaller rapids before you need it in a crux move. Although it takes special skills to guide a crew of paddlers through difficult rapids, it’s also very rewarding. Being able to share the beauty and wonder of a river with other people is a gift. Being able to teach unskilled paddlers how to negotiate rapids is an art. And nothing cures the late summer burnout like having a crew of first-time rafters laughing and smiling from the thrill of whitewater. Editor’s Note: Action shots courtesy of Southeastern Expeditions. To read the first two articles in the Guide School Series, check out Using Your Body and Using Your Oars.